Pharmacy operations are the tasks that every single mistake can be proved fatal and lower down its revenue as well as harm its credibility. On the average, if you’re expecting 4 wrong prescriptions and drug delivery on a daily basis that is usually due to workload and lack of proper management. It errors can occur due to wrong accounting calculations, security issues, and customer services department. The rise of inaccuracies needs to be controlled with effective planning and support of healthcare information systems. Integration of pharmacy management module it should be compulsory to improve the efficiency of workflow. Right solution implementation ultimately increases ROI. Still, we’re not committing perfect solution but ensure to decrease your productivity problems. The right software enables automation in routine operations of the healthcare center from hospital to pharmacy. Automating the processes means you can avail huge advantages through operational automation. Let’s have a look at a few advantages that can be availed by taking the decision to implement a right solution that may increase business productivity. Why Should You Integrate Pharmacy Module in Healthcare Information Systems? Pharmacies usually deal with prescriptions and medication delivery. This is the basic goal that includes a wide range of additional tasks. It includes reviewing prescriptions, adding, filling and ensuring its availability. Furthermore, it also processes also includes the communication with vendor and doctors at different levels. Pharmacy module is fully equipped with supply chain management that helps in streamlining all workflow. In this way, efficient healthcare information system supports in the availability of drugs on time. Pharmacy management is not an easy job for a human being because it requires 100% accuracy. The workload may lead to tiredness and operational inaccuracies. Pharmacy operations should have a higher level of agility to maintain streamline and easy workflow. The software solution should be scalable and capable enough according to healthcare environments. All predictive and repetitive operations should be automated without any error. 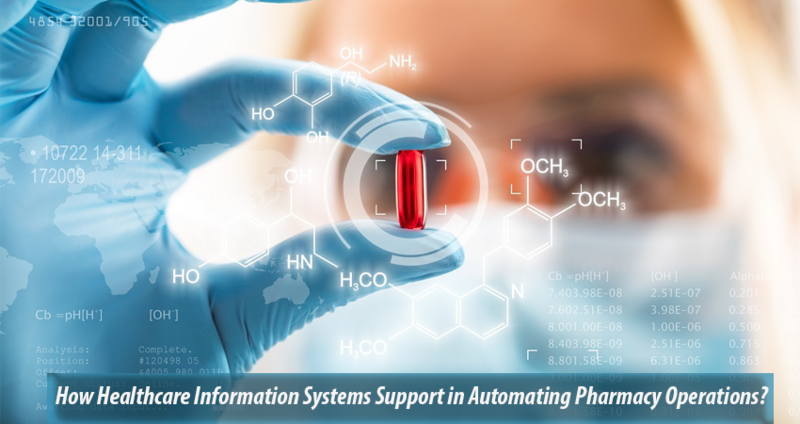 Automation of healthcare information software with pharmacy management solution is adopted by the centers to avoid inaccuracies. The software will maintain the patient’s medicine record and process purchase order automatically. The ultimate goal of healthcare information system implementation is bringing an automation and workflow streamlining with effective management and eliminating errors. Successful implementation of the right solution increases efficiency and productivity as well as support in lowering down the expenditures. Automatic prescription scanning manages inventory. In pharmaceutical industry information regarding drugs and prescriptions is necessary. Therefore the availability of pharmacy experts is needed to avoid unexpected happenings. The pharmaceutical solution makes it easier to maintain a record, check prescription and ensure accurate drug delivery to resolve major issues. The entire process becomes more easy and fast, enable the pharmacist to serve more customer that at the same time. Let’s suppose you’re finding the name of medicine difficult or identical. The software helps you in identifying them in a quick way without any problem. Once you’ve added the name and details of medicine in software things will be easier. Complete workflow can be completed automatically and efficiently. We can say that the right implementation has made pharmacy management more responsive and functional. Like all other industries, in pharmacy customer services and customer handling are the important requirements to improve ROI. If you’re not coming up to customer’s expectations you can’t improve your productivity. Pharmacy software solution is designed and developed by keeping customers satisfaction into consideration. It supports in addressing customer’s issues in positive manners. Efficient healthcare information systems keep the customer engaged regarding their health updates. Let’s suppose doctor has prescribed to re-visit again after one month and the patient has made an appointment. The software will send an auto alert so the customer can’t forget their appointment date. On the other hand, if a customer is visiting your pharmacy with prescription and drugs are not available, it may also harm your business productivity. The software helps you in getting inventory updates and managing customer relations by handling all their information. The software can take care of all repetitive tasks so, you can pay more attention to the customer and their requirements. Whether you’re a pharmacist or a doctor you attention in necessary to keep your customers content. This is a right time to organize all your healthcare business with the integration of right software. Healthcare information systems are not necessary for the hospitals but are capable to perform all important tasks for your business and optimize is according to market trends.